Dionysus Records, artist Lisa Petrucci and a gaggle of sixteen sensational, international growlinggirl powered groups all come together for a fun frolic for fans of female frenzy! 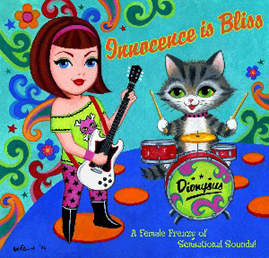 INNOCENCE IS BLISS bringsyou women worldwide wailing on your auditory senses. THE PORTUGAL JAPAN, NASTIES, THE PEBBLES, THE BOONARAAAS, THECOCTAIL SLIPPERS, THE PLUNGERS, ZOMBINA and theSKELETONES, WHYS, LOST PATROL, BUTTERSPRITES, THE MUDLARKS, THE YOUNG WEREWOLVES, TIZZY, MYDOLS, ANNA AND THE PSYCHOMEN and THE RABIES take you on a garage/punk/surf/psychobilly tour of Japan,Europe and the USA! The CD is limited to aone time pressing. The LP is limited to 500 and includes a free CD for your uploading pleasure, of the legal kind! THIS IS NOT THE VERSION SIGNED BY THE ARTIST.